In 1969, Alan received what he thought at the time to be a prank phone call, but was actually John Lennon calling to ask Alan to join his 'Plastic Ono Band'. The next day Alan found himself learning songs in the back of an airliner en-route to Toronto with John Lennon, Yoko Ono, Eric Clapton and Klaus Voorman. The ensuing album, 'Live Peace in Toronto', sold millions of copies, peaking at number 10 on the pop charts. Far from just a time-keeper, Alan has written a large part of Yes' music; from the chord sequences for the beautiful 'Turn of the Century', from the album 'Going for the One' (1977), to many of the themes on Tormato (1978) and Drama (1980), to the hypnotic opening to 'Mind Drive', from 'Keys to Ascension 2' (1997) as well as the beautiful piano intro to 'In the Presence Of', from 'Magnification' (2001). 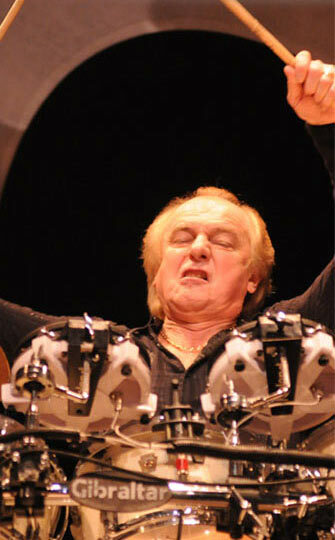 For a more information on Alan's career, visit his web site at alanwhite.net.